In Zen Mind, Strong Body, acclaimed bodyweight exercise expert Al Kavadlo presents his “philosophy of fitness”—a philosophy that has allowed him to endure injury-free, while achieving some of the world’s most challenging movements, be it the One-arm Pull-up, the Human Flag, the Stand-to-stand Bridge, or the Front Lever. It’s also a philosophy that’s allowed Al to sculpt a magnificent physique—while maintaining an ever-burning passion to further develop his calisthenic excellence. Al’s “secret sauce”? A Zen-like attitude to physical cultivation—which marries intense focus with a light-hearted “joy-in-the-journey.” Zen-like too, is Al’s insistence on intuitive simplicity and his celebration of personal, direct experience as the most trustworthy teacher. 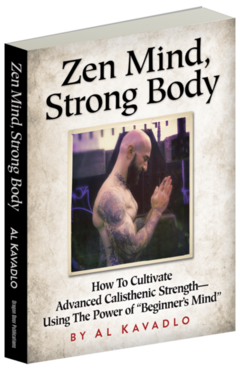 Zen Mind, Strong Body culls 26 of Al’s favorite articles, elaborating his position on a wide spectrum of fitness subjects from diet and supplements, to machines and free weights, to cardio options, to mental training. For Al, though, all roads finally lead to Bodyweight Exercise—as the supreme path for all-around, everyday athleticism and practical functionality. Want what Al Kavadlo has? Absorb the hard-earned, earthy training wisdom in Zen Mind, Strong Body—and you will be on your way. Breaking Muscle is the fitness world’s preeminent destination for timely, high-quality information on exercise, fitness, health, and nutrition.